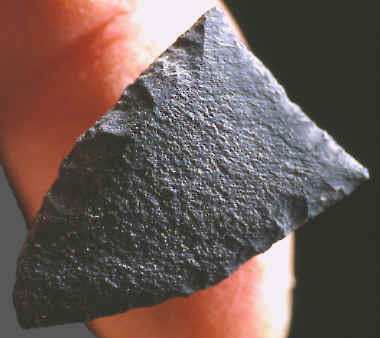 This Subtriangular point represents one of two different styles of Nenana complex projectile points. Chindadn points have rounded or tear-drop shaped bases, this example has a very straight base. Moose Creek is the first site in the Nenana Valley to produce both the tear-drop and triangular style of Nenana complex projectile points. This point was manufactured on a smooth flake of basalt that was pressure flaked along the edges into shape. It measures 1 1/16 inches (2.6 cm) long, 11/16 inch (1.7 cm) wide and 2 mm thick. 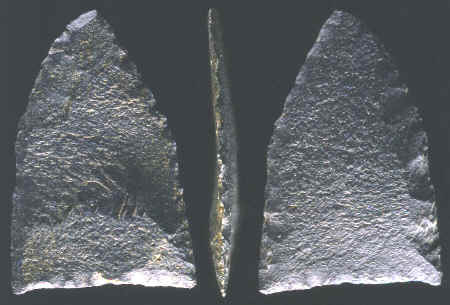 This picture shows three views of the original subtriangular point that was found during the 1996 excavation of the Moose Creek site. The Moose Creek site was discovered in 1978 by J.F. Hoffecker and C.R. Waythomas during the North Alaska Range Early Man Project. The site was re-excavated in 1996 by Georges A. Pearson (University of Kansas). Moose Creek is a Late Pleistocene-Early Holocene multi-component site that contains a Nenana complex occupation overlaid by two superimposed Denali complex components. 1991, "Clovis Origins and Adaptations," "The Nenana Complex of Alaska and Clovis Origins," by Ted Goebel, Roger Powers and Nancy Bigelow, pp 49-76. 1993, "From Kostenki to Clovis," "The Ones That Will Not Go Away," by J.M. Adovasio, pp. 203-204. 1997, "Expedition Affirms Significance of Moose Creek Site," Mammoth Trumpet, Vol. 12, No. 4, October, pp. 13-18. 1997, "new Evidence for a Nenana-Complex Occupation at the Moose Creek Site, Central Alaska: Preliminary Results of the 1996 Re-excavation," Archaeology, CRP 14, by Georges A. Pearson, pp. 72-74. 1999, "Early Occupation and Cultural Sequence at Moose Creek: A Late Pleistocene Site in Central Alaska," Arctic Vol. 52, No. 4, by Georges A. Pearson, pp. 332-345. 2002, "Late-Pleistocene and Holocene Microblade Industries at the Moose Creek Site," Archaeology, CRP 17, by Georges A. Pearson, pp. 64-65. Personal communications with Dr. Georges A. Pearson.